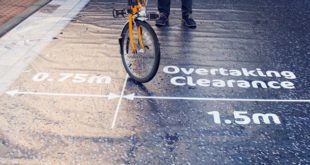 An improved bike shipping box is now available from BikeFlights.com. 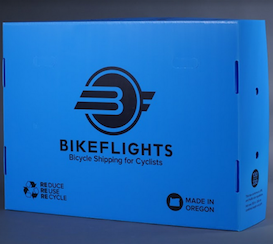 The new blue box features the same internal suspension design as BikeFlights.com’s cardboard bike shipping box released last summer, but is made of Coroplast for improved water resistance, increased strength and more durability. 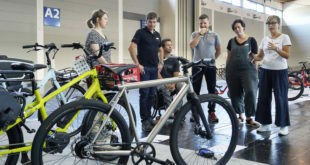 “Our new blue bike shipping box is great because it lasts for more shipments than a cardboard box,” commented BikeFlights.com owner William Alcorn. At 43 x 11 x 32 inches, the box meets shipping and airline size restrictions. Its self-locking flap design eliminates the need for external straps and fasteners and the box can be sealed with standard packing tape. When not in use, it collapses flat to save space and store easily. Like the cardboard box, the new blue box meets drop and shake standards as-per the International Safe Transit Association Vibration and Shock Test. It comes with protective fork and frame dropout spacers. Blue bike boxes are available for customers within the U.S. to purchase in BikeFlights.com’s online store.